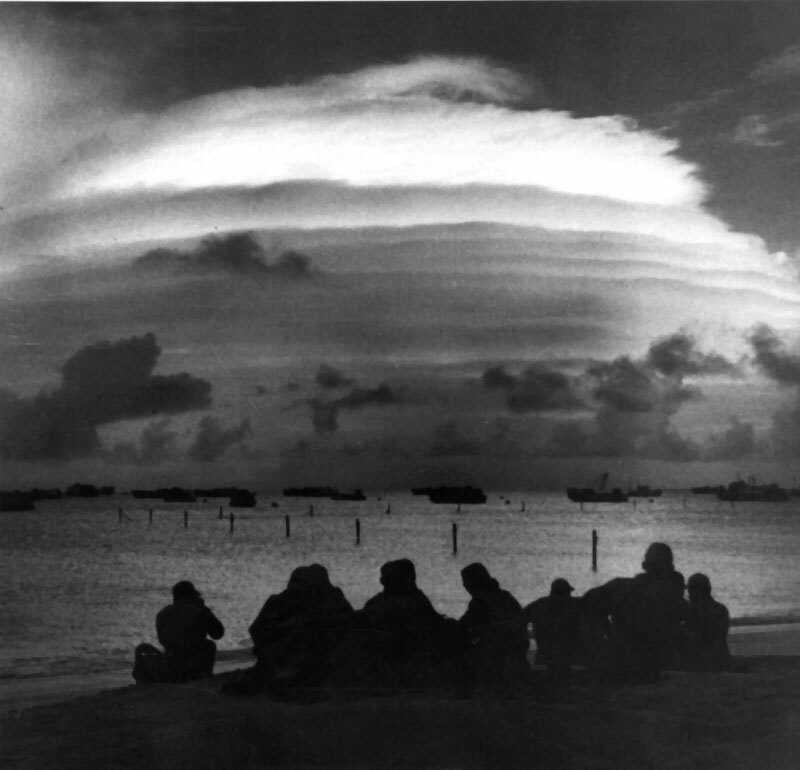 Service members watch Operation Ivy’s atomic test, code named King, on Enewetak Atoll on Nov. 15, 1952. The USS De Haven sailed from Hawaii’s Pearl Harbor on May 5, 1958, carrying 240 men deep into the Pacific on a secret mission. Gunner’s mate Wayne Brooks had only a vague idea of their destination. But within a few days, he would experience an explosion so immense and bright that he could see his own bones. He and his crewmates had been assigned to witness Operation Hardtack I, a series of nuclear tests in the Pacific. What seems like a story long tucked away in history books remains a very real struggle for those veterans still alive, the radiation cleanup crews who followed and their families – many of them sick and lacking not just the federal compensation, but also the recognition they believe they deserve. There is no commendation or medal for being an atomic vet. The magnitude of the De Haven’s mission became clearer even before the crew reached Enewetak. As they reached an area near where tests already had been underway, they sailed into heavy showers. Radioactive rain poured down and “hot” seawater contaminated the ship’s wash-down system. The sailors were ordered to decontaminate the ship by scrubbing the decks with long-handled brushes. 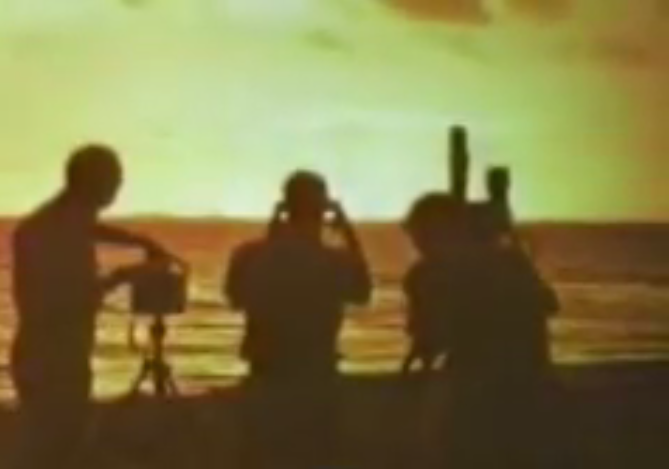 Then, as they closed in on Enewetak on May 12, Brooks spotted a far-off flash in the distance: a nuclear blast. The next morning, a countdown blared from the De Haven’s PA system. 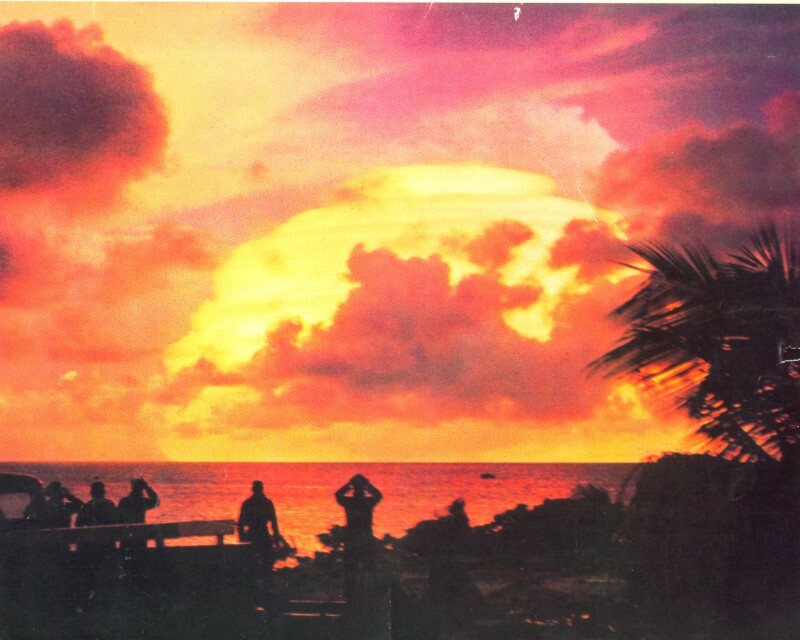 A nuclear test – code name Koa – was being conducted from a barge in the lagoon of Enewetak Atoll. Its blast would release at least 75 times the power of the bomb that killed more than 130,000 people in Hiroshima, Japan, in 1945. 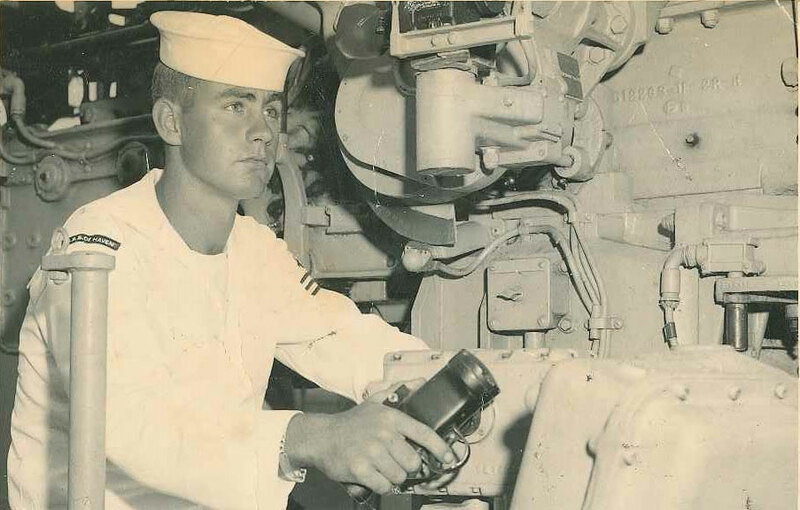 Brooks, a slender Texan, had enlisted in the Navy a year earlier at 17. That morning, he manned his gun station on deck. He had no special goggles or clothing. He and the other sailors wore long-sleeved shirts and tucked their pant legs into their socks. They did as they had been told, turning away from the blast site and putting their hands over their eyes. Shockwaves moved across the water. When the ship began to rock, Brooks uncovered his eyes and turned back toward the blast site. He saw a mushroom cloud rising into the sky. Three days later, Brooks witnessed another blast. The shot, named Wahoo, was detonated 500 feet underwater. It sent a column of water hundreds of feet into the air, a surge taller than the nearby empty target ships. The De Haven, only 3 miles from the explosion, shook “violently with a loud cracking,” and Brooks recalled rivets popping from their metal moorings. His story is not unique. In the aftermath of World War II and during the height of the Cold War – between 1946 and 1962 – the U.S. detonated more than 200 above-ground and undersea nuclear bombs. Over three months, Brooks would witness 27 of them. In the decades since Brooks witnessed those 27 tests, he has suffered throat and lung problems, rashes and prostate cancer. Like other atomic veterans, he blames his ailments on his radiation exposure. So far, the U.S. Department of Veterans Affairs seems to disagree. Brooks has applied multiple times for the special VA compensation reserved for atomic veterans. He was denied each time on the grounds that his pains and diseases are not among those that qualify. This was a common experience among the dozens of atomic vets interviewed by Reveal from The Center for Investigative Reporting. Many feel, as Brooks does, abused, neglected and forgotten by the government and a country that exposed them to unforeseen risks. The estimated number of service members who participated in the tests varies from source to source, but could be as high as 400,000. Brooks is among the fortunate: Even with his health challenges, he still is alive. One of the few studies of atomic veterans looked at about 3,000 participants in a 1957 Nevada test shot code named Smoky. Released in 1979 by the Center for Disease Control, it found that they had more than twice the rate of leukemia than their peers – eight cases versus 3.5. Other studies have been inconclusive. The atomic testing program included a wide range of experiments and exposures. Thousands of service members were on ships in the Pacific. Thousands more stood or crouched in trenches carved into the Nevada desert. Pilots and their crews flew planes into mushroom clouds. Others were underwater in the ocean as blasts were detonated, swimming as frogmen or in submarines. Some parachuted into blast sites soon after the explosions. The military had a long history of using war games to train troops. 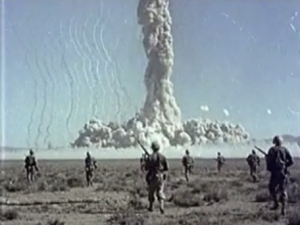 During the nuclear testing era, troops were exposed to detonations to see how they would react to a nuclear attack and whether equipment still would function. All of the atomic vets were sworn to secrecy. Until the secrecy was lifted decades later, they could not tell anyone about their experiences. Even if they became ill, they could not tell doctors they might have been exposed to radiation. Scientists had known from the earliest days of building the atomic bomb that radiation posed risks. Research found increased rates of certain cancers among the survivors of the Japanese bombings. It also showed that the children of survivors were more likely to have smaller heads and physical disabilities. But there never was a coordinated attempt to study or track the health effects of radiation on the atomic vets or their children. Brooks is a gentle man who ties back his long gray hair in a ponytail. 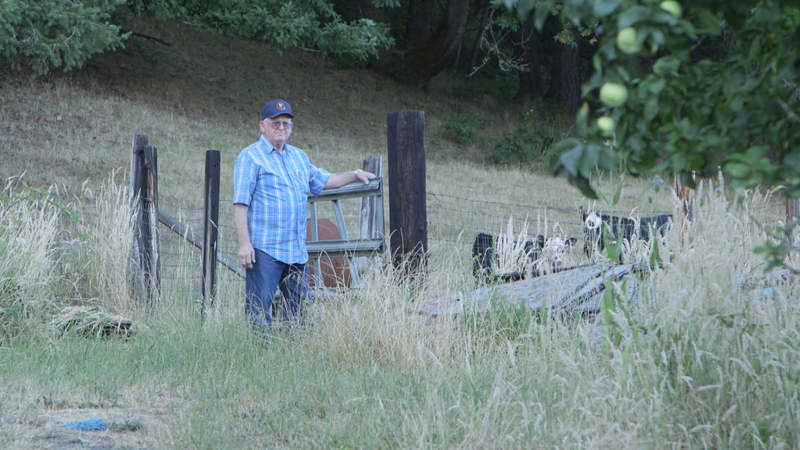 He still speaks with a West Texas accent but now lives outside Portland, Oregon. He belongs to the National Association of Atomic Veterans, a group trying to help others get compensation and push for recognition. He also coordinates quarterly meetings of local atomic veterans at an American Legion hall, where they share their experiences and support one another. The meetings started in the mid-1990s with about 50 members. Eight men attended the January meeting. “I think this is all we have left,” Brooks said at the time. Jim Bunting was not at that January meeting. He died in December at 76, after a series of health problems. But he attended a barbecue in July, where the men and their wives gathered around picnic benches behind an American Legion hall near Portland. A thin man with sharp blue eyes and a trim mustache, Bunting got around with the aid of a cane. He wore a blue jacket covered with military patches, including one from the National Association of Atomic Veterans. 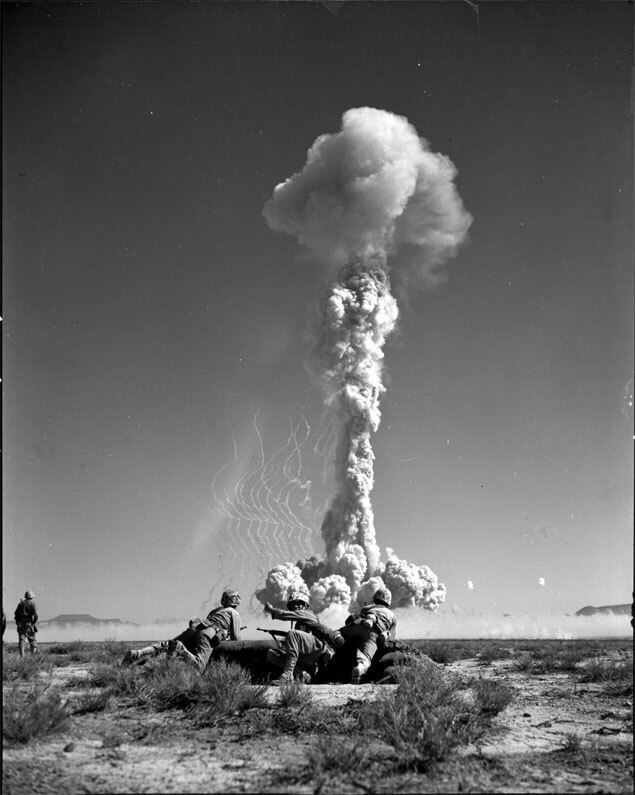 Bunting became an atomic veteran when he witnessed the largest above-ground nuclear explosion on U.S. soil: Shot Hood, a 74-kiloton blast in the Nevada desert. More than 3,000 personnel were there, two-thirds of them Marines. Like Bunting, then 18, many were on temporary assignment from Camp Pendleton near San Diego. 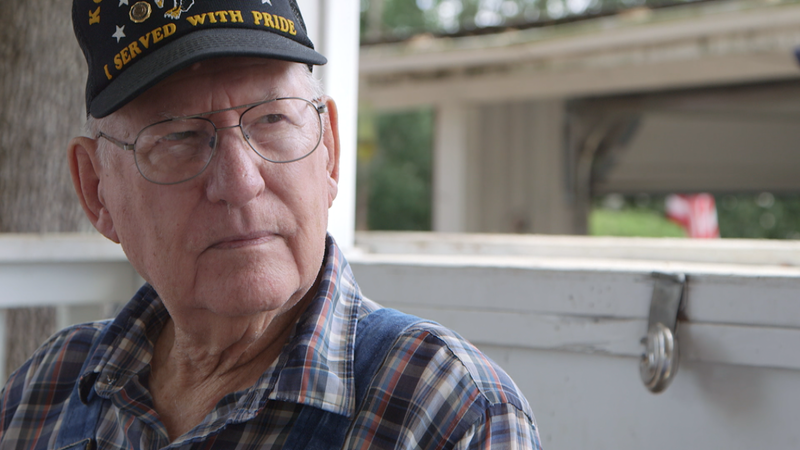 Before dawn on July 5, 1957, Bunting and his fellow Marines clambered down into trenches. He remembered that day vividly. He said he crouched in a trench 3,500 yards from the detonation site. He was given dark glasses to wear. As nearly every atomic vet was told to do before a blast, he put his arms over his eyes. When the flash came, he saw the bones in his arms. The detonation ignited brush fires, and the shock caused some trenches to collapse. It shattered windows and shook buildings in mining communities at least 60 miles north of the test area. People in Los Angeles could feel the ground shake from the blast, according to government documents, and San Franciscans could see the flash. After the blast, Bunting and other Marines were ordered out of the trenches. They participated in a “coordinated air-ground maneuver against the attack objective,” according to a Defense Nuclear Agency report about Shot Hood. The health problems came later. Bunting did not apply for atomic veterans compensation because he knew his conditions were not eligible, even though studies have linked radiation exposure to heart attacks and strokes. But he wanted atomic veterans to get recognition. He died of congestive heart failure on Dec. 16 without seeing that happen. Of the 376 atomic veterans Grahlfs surveyed, nearly half had health problems they attributed to their participation in the tests. About 1 in 5 said family members had health problems they thought might be related, too. He enlisted in the Navy in 1942, two months shy of his 20th birthday. 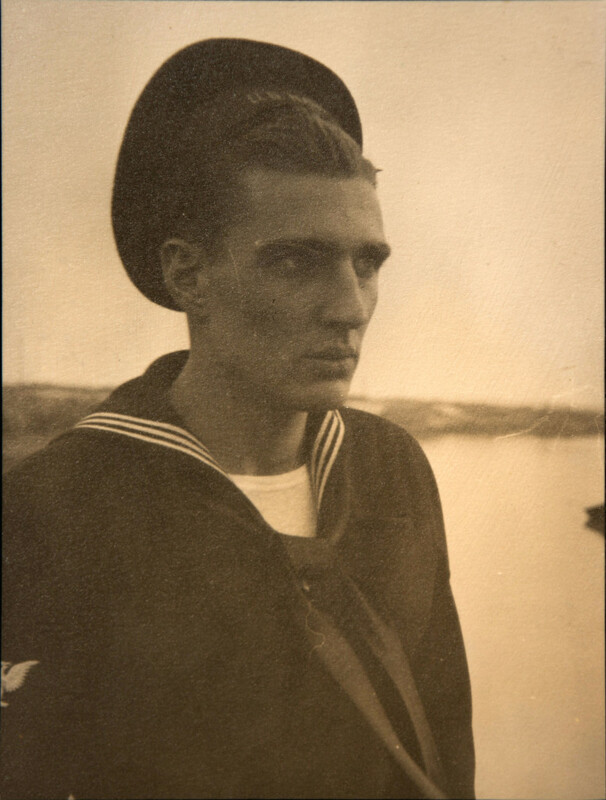 When World War II ended three years later, Grahlfs was the lead quartermaster on a seagoing tugboat. He was stationed in San Francisco when the Navy asked for volunteers to participate in an atomic test. “My commanding officer said a guy would have to be crazy to volunteer for that service,” Grahlfs said. 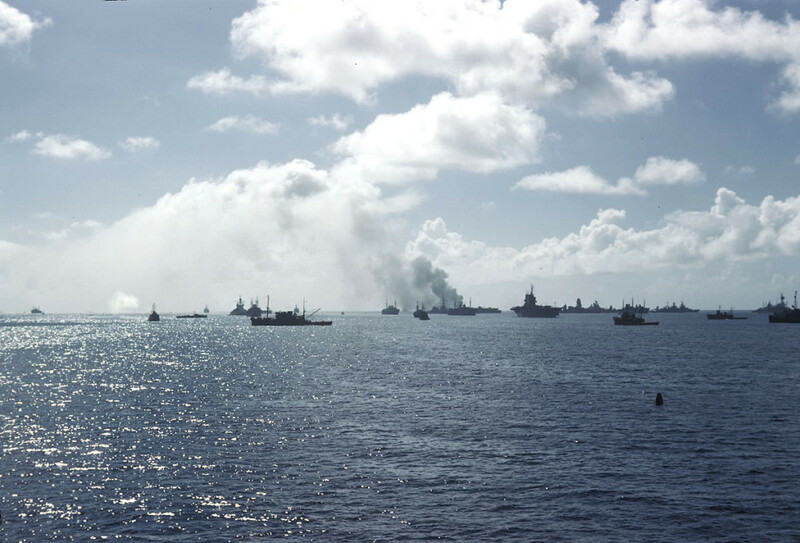 Too few volunteers stepped up, so Grahlfs and others were ordered to the Marshall Islands. He was assigned to Operation Crossroads, a series of tests around Bikini Atoll. He was the helmsman, steering a 146-foot-long wooden-hulled tug toward an atomic blast code named Able. The bomb exploded on the morning of July 1, 1946, about 10 miles away. He and his crew were told when the countdown started to put their arms over their eyes. He had no special glasses. Grahlfs still had his arm over his eyes when the pressure wave hit. But that was not the end of it. Within a few hours, Grahlfs’ tugboat and others were ordered into the highly radioactive lagoon where the bomb had been detonated. Empty ships placed varying distances from the blast to test their resilience were ablaze. He and his crew helped put out a fire on the USS Independence. Two more tests were scheduled for Operation Crossroads, but only one of those shots, Baker, was conducted. Radioactive water contaminated nearby ships. The third shot, Charlie, was canceled when the Navy could not decontaminate them. He knows that he is fortunate to be alive, despite health problems that include several bouts with skin cancer and prostate cancer over the years. Grahlfs gets about $650 per month in compensation for skin cancer. He applied for compensation in August 2012, though it took nearly two years for the money to show up. His bigger concern is what his exposure might have done to his children and grandchildren. Grahlfs’ daughter suffered from endocrine problems throughout her teenage years and died of a malignant brain tumor in 1996 at 46. One son has bipolar disorder. Another has Addison’s disease, a rare adrenal condition. His granddaughter was born with a deformed foot. “That’s a pretty full plate for somebody who never had any history of any of these things in my family,” Grahlfs said. Why, he asks, has the government never studied what radiation exposure may have done to families? He works with the National Association of Atomic Veterans, often taking calls from others vets trying to get help for themselves and others. The children and grandchildren of other atomic vets have reported immune disorders, cancers and reproductive problems. Veterans and their families have pushed for a federally funded study of the generational effects of the testing era. Leading the charge was Pat Broudy, the widow of atomic veteran Charles Broudy, who died of lymphatic cancer in 1977, at 56. Congress eventually called for a feasibility test to see whether a study of the families of atomic veterans could be done. Researchers concluded in 1995 that it would be too difficult to find subjects and connect them to their parents’ exposure levels. The U.S. nuclear weapons testing program began July 16, 1945, part of the Manhattan Project that led up to bombs being dropped on two Japanese cities less than a month later. Code named Trinity, the blast went off at Alamogordo Bombing and Gunnery Range in New Mexico. Many credited the two bombs dropped on Japan for ending World War II and the U.S. military’s subsequent atomic tests for preventing World War III. Even before the bombings of Hiroshima and Nagasaki, scientists knew the dangers of the weapon. “From the earliest days of Los Alamos, they were well aware of the dangers of radioactivity,” Hopkins said. 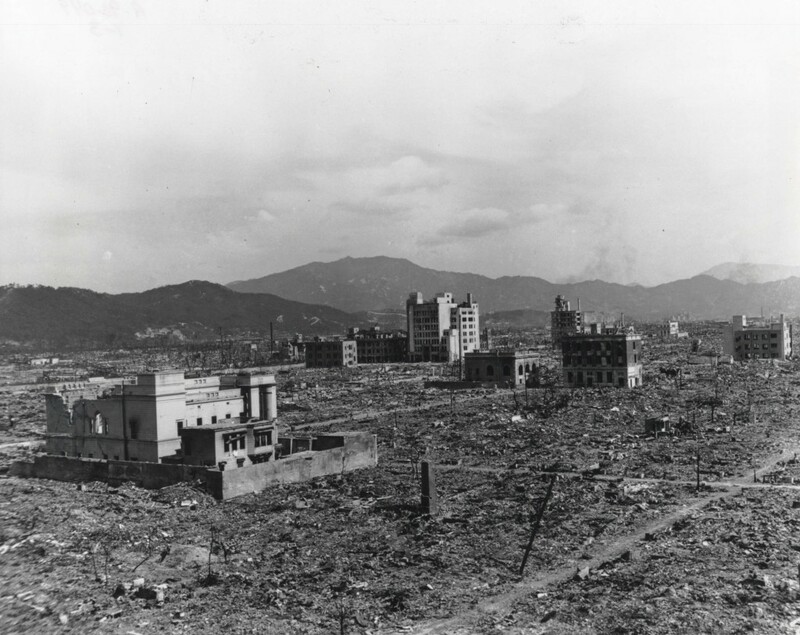 Those dangers became very clear after the bombs decimated Hiroshima and Nagasaki. Saugstad, now 91, was assigned to deliver mail to troops in Japanese cities after the bombing. After a few weeks there, his hair fell out and he started having convulsions. He said he was hospitalized for 30 days. He said he never was told that he had radiation poisoning. He applied for disability compensation after he got out of the Navy, but was told that he would have to prove that he was exposed to radiation. Even after contacting members of Congress and state legislators, Saugstad has not been able to get copies of the records that show he was in Japan. 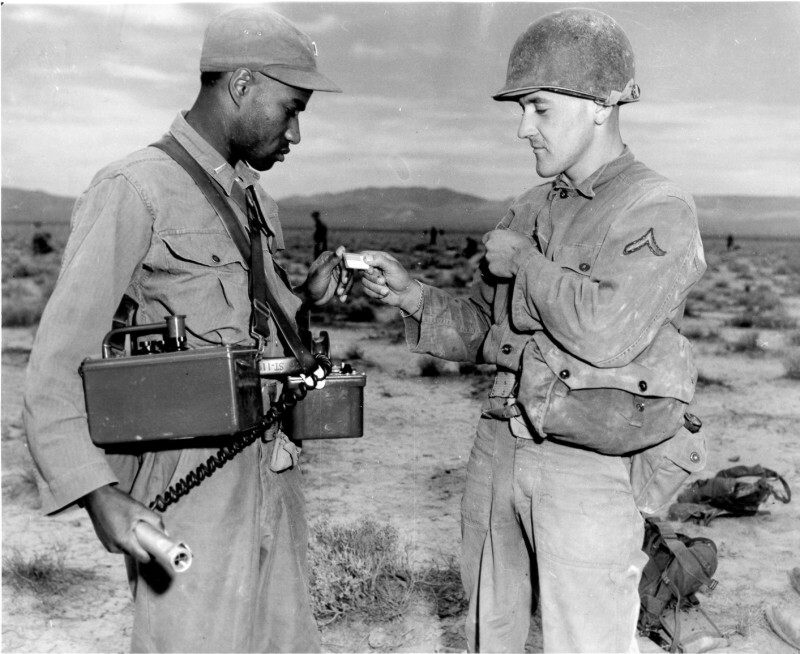 Two service members after an Operation Tumbler-Snapper shot in 1952. 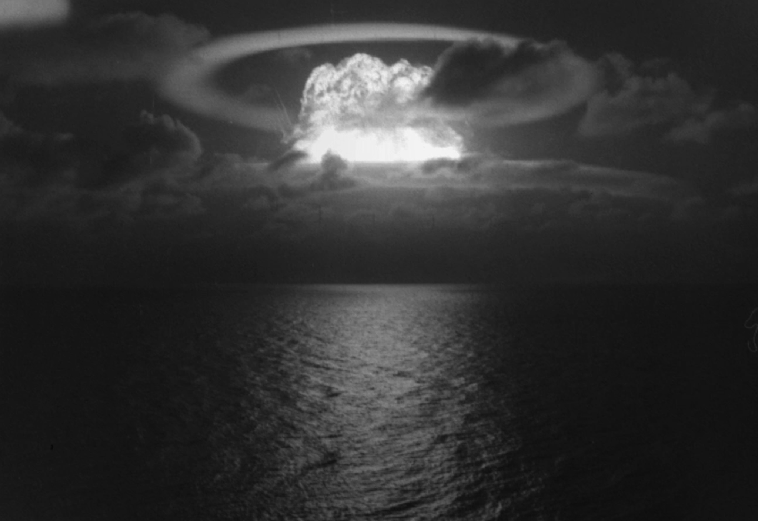 Soon after the war ended, the U.S. ramped up its nuclear testing program – flexing its strength before the Soviet Union. The first post-war test was Operation Crossroads at Bikini Atoll in 1946. Testing continued, returning to U.S. soil in Nevada in 1951. Blasts were designed to study what a nuclear weapon would do to a wide range of subjects – humans, buildings, animals, even fabrics. Operation Cue, a 1955 Nevada test, was designed to study home construction, food and clothing. Mannequin families were stationed in houses made from various materials to see how they would hold up to the blasts. Several tests included animals – sheep, monkeys, pigs, horses, goats, actual guinea pigs – to see how they would be affected by the blast. They did not fare well, remembers Walter Kennedy, who was an Army sergeant based out of Fort Lewis, Washington. 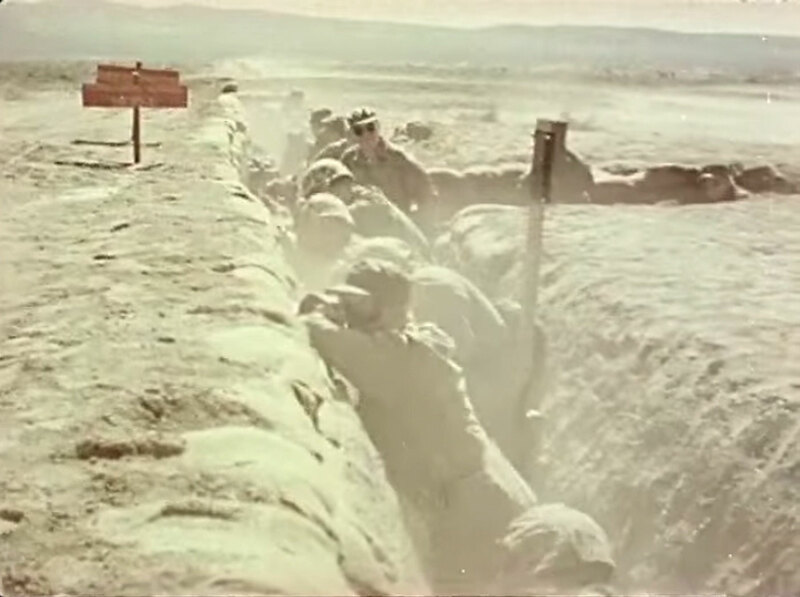 Kennedy was assigned to put animals into trenches before the Nevada tests. After the blasts, he a drove a front loader, dumping dirt over their charred carcasses. Kennedy, now 84, participated in five atomic tests. He has no idea why the animals were exposed, he said, but he knows what happened to them. In other tests, monkeys and mice were flown into detonation clouds in unmanned planes to test the effects of radiation on them. Concerns about radiation grew more widespread as the tests continued. Top scientists, including Nobel Prize winner Linus Pauling, began to speak out against the tests. In 1959, tests found elevated radiation deposits in wheat and milk produced in the northern United States. Politicians began to push for a ban on atmospheric testing. In 1963, the Partial Test Ban Treaty ­– signed by the U.S., United Kingdom and Soviet Union – stopped all but underground nuclear testing. But testing continued underground. The U.S. conducted more than 800 such tests after 1963. 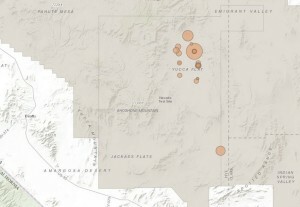 Today, the Nevada site, a 1,300-square-mile secured area about 65 miles northwest of Las Vegas, is pocked by craters created when ceilings of the underground explosion chambers collapsed. The largest is nearly a quarter-mile across and 320 feet deep. It was not until 1996 that all testing by detonation, even underground, was banned. Today, the U.S. Department of Energy tests weapons using complex computer simulations. It also evaluates nuclear weapons by studying the impact of shooting high-speed projectiles at tiny plutonium targets. As the years after the tests passed, many individuals – both military and civilian – who worked in connection with the atomic testing program reported health problems. Residents who lived downwind from the Nevada tests reported thyroid problems, central nervous system tumors and multiple cancers. Health effects of radiation can take years to appear. As some atomic vets began getting sick, they risked violating their secrecy oaths and started to speak up. Orville Kelly, an Army veteran who witnessed 22 detonations in the Marshall Islands and founded the National Association of Atomic Veterans, was scheduled to testify before the Senate Committee on Veterans’ Affairs in June 1979. He was hospitalized and could not attend but asked another veteran to read his remarks. If you or a family member has had direct experience as an atomic veteran or Marshall Islands cleanup veteran, we want to hear from you. You can share your story with us here. “I am asking … that the U.S. Government assume responsibility for the medical conditions of people like myself who just want the right to die in peace, knowing some of their family’s problems will be eased by Veterans’ Administration pensions,” the statement said. Kelly had been diagnosed with lymphoma in 1973, but his multiple claims for a disability pension were denied. The VA finally granted his claim in November 1979. He died seven months later, at 49. In 1988, Congress passed legislation to compensate radiation-exposed veterans who developed any of 13 types of cancer. Over the years, others were added to the list. Today, 21 cancers, known as presumptive diseases, are covered. Veterans with these presumptive diseases do not have to prove the cancers were caused by radiation exposure, but they do have to prove they participated in nuclear tests. They are eligible for a monthly VA disability stipend that can range from about $130 to nearly $2,900. Spouses of veterans who died of presumptive illnesses also are eligible for compensation. Veterans with other diseases – such as tumors of the central nervous system, thyroid problems and cancers not on the presumptive list – must prove their illnesses are connected to radiation exposure. Proving that connection often is difficult. Leo Feurt – a Navy veteran who was aboard the USS Boxer during Operation Hardtack I, a series of tests in the Marshall Islands in 1958 – has been trying to get compensation since doctors removed a lemon-sized tumor from his left side in 2006. Because it was not cancerous, Feurt, 77, isn’t eligible for automatic compensation. He has what is called a schwannoma, a benign tumor that can keep growing until it moves in on vital organs. His original application for compensation was denied in 2010. He got an appeal hearing in February after three years and now is awaiting a decision. Because of the secrecy around the nuclear tests, some veterans do not have documents showing they participated in the tests. In addition, many of the documents that did exist were destroyed in a fire at a military records facility in St. Louis more than four decades ago. Congress passed legislation in 1990 to compensate residents who lived downwind of atomic blasts, uranium miners and on-site participants in atomic tests. The program, administered by the U.S. Department of Justice, awards a lump sum of $50,000 to $100,000 to applicants with any of 20 cancers if a doctor attests that the disease was caused by ionizing radiation. Some atomic veterans are eligible for this program, but any who receive it have to pay back prior VA compensation for the same health condition. Not all veterans are aware they are eligible for any compensation. Frank Farmer didn’t know he could get compensation until 2003, when he spotted a notice on the bulletin board at his local American Legion hall. Farmer said he’s one of the lucky ones. The 80-year-old has had tinnitus and a rash ever since he was in the atomic blasts. He was aboard the USS Hooper Island during Operation Hardtack I. He gets monthly compensation of about $600 for his hearing loss. Thousands of other veterans died without compensation. Howard Pierson was a young Marine at Camp Pendleton in 1957 when he was bused to the Nevada desert to witness Shot Hood from a trench. Decades later, in 1999, Pierson was diagnosed with lung cancer. In less than two years, he was dead. “I don’t think he had any idea that having participated in that test, when he was 19 years old, that would cause him to die at an early age of 62,” said his widow, Debra Pierson. Debra Pierson, who works in veterans services for Larimer County, Colorado, remembers her husband mentioning the tests. She suggested he apply for compensation. The application was denied. Lung cancer was not a presumptive illness at that time. But Debra Pierson wasn’t going to give up. In July 2000, she took her husband’s case to the Board of Veterans Appeals, a review panel within the VA. Once again, the claim was denied. In 2002, two years after Howard Pierson died, lung cancer was added to the presumptive list. By default, Debra Pierson became the beneficiary of her husband’s compensation payments of about $1,250 per month. But she felt strongly that the case should be retroactive to the date her husband applied – not the date when lung cancer made it on the presumptive list. She went back to the review board and asked for an earlier effective date, but that request was denied. Years later, Debra Pierson consulted a doctor who reviewed her husband’s records and wrote to the VA stating that he thought Howard Pierson’s cancer was connected to radiation exposure. While the board still denied retroactive payments, it said a “clear and unmistakable error has been found” in not ruling previously that Howard Pierson’s cancer had been service connected. “To me, that’s still a win,” Debra Pierson said. The process was arduous and complicated, even for someone who makes a living helping veterans apply for benefits. She hopes what she learned can help others. Reveal asked the VA for the total number of radiation compensation claims, the number granted and the number denied since the 1988 law was passed. It provided the number of claims since Oct. 1: 520. It also said 115 were pending as of May 17. But some atomic veterans did not pursue medical treatment or compensation because they had taken oaths of secrecy when they served. The veil of secrecy was not lifted officially until 1996. 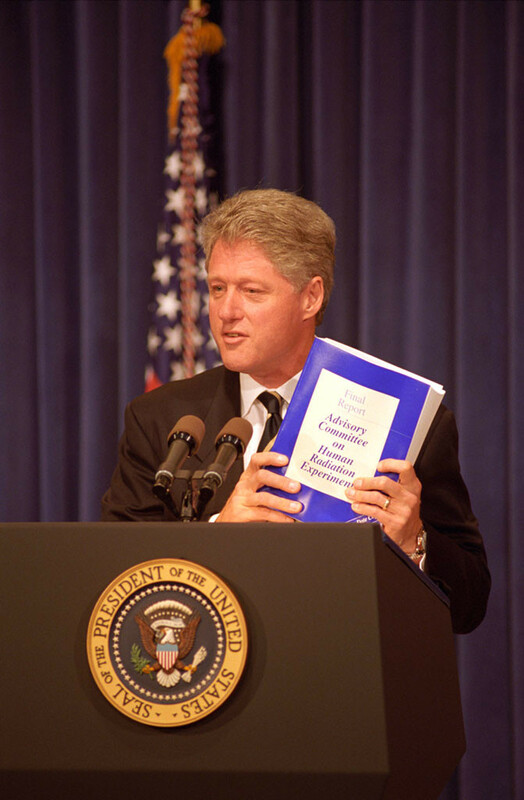 Following a 1993 investigation by the Albuquerque Tribune, President Bill Clinton created a committee to look into U.S. human radiation experiments. Reporter Eileen Welsome’s six-year investigation revealed the names of 18 Americans who in the 1940s were injected with plutonium without their knowledge by government scientists. The committee was asked to look into not only plutonium injections, but also other radiation experiments, such as one in which researchers fed oatmeal containing radioactive material to children at the Fernald State School in Massachusetts. Atomic veterans were not included in the study at first. Then, as the committee solicited public input, “overwhelmingly, the single largest group of people who responded right from the beginning were atomic veterans or their families,” said Ruth Faden, the committee’s chairwoman. “We were stunned, just stunned at the challenges” that atomic vets faced getting information “just to find out what happened to them,” she said. When the committee’s findings were released in October 1995, Clinton publicly apologized for the radiation experiments, and the veterans’ veil of secrecy was lifted soon after, in 1996. “And under our watch, we will no longer hide the truth from our citizens,” he said in his speech. He also vowed that the government would compensate those affected by the experiments. The announcement was lost in other news on that day: A Los Angeles jury announced the verdict in the O.J. Simpson murder trial. 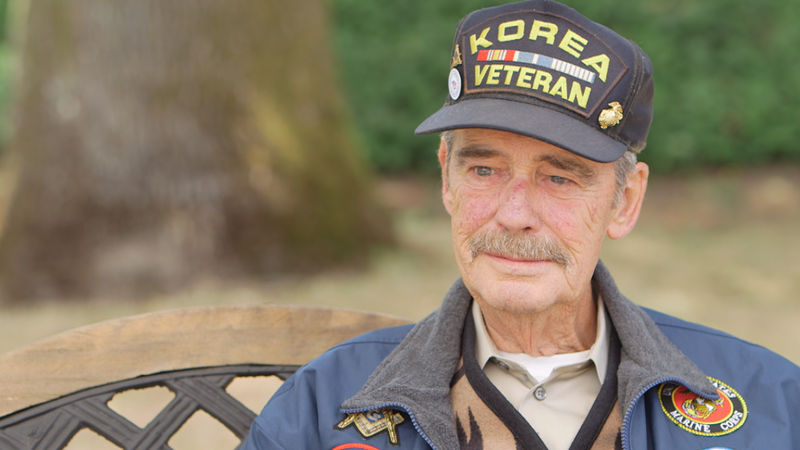 Beyond compensation, many atomic veterans want to be recognized for their sacrifice. In 1983, President Ronald Reagan issued a proclamation making July 16 National Atomic Veterans’ Day. But it was a one-time event. Year after year, bills have been introduced in Congress to create a service medal for atomic veterans. None have made it out of committee. Pushing for change has been a challenge for a group whose members are aging and dying. 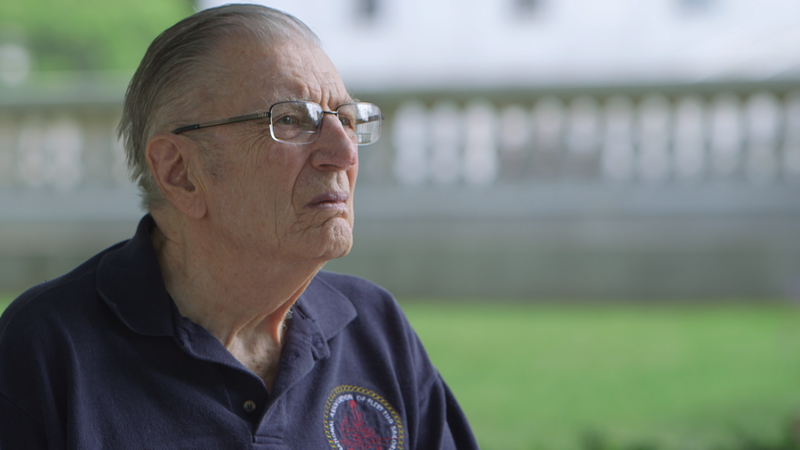 The youngest remaining atomic veterans are in their 70s. Many more are in their 80s and 90s. Now, the push has been taken up by a younger group of veterans who never witnessed the atomic blasts but were exposed to their aftermath. 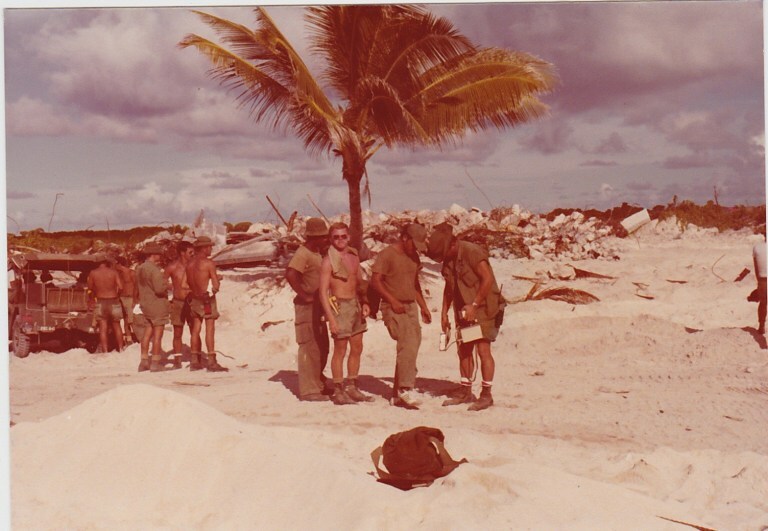 Decades after Wayne Brooks and Lincoln Grahlfs witnessed their last atomic tests in the Marshall Islands, troops returned to ready some islands to be returned to the Marshallese. Of the 8,000 personnel who worked on the cleanup from 1972 to 1980, nearly 2,700 were Army engineers such as Steve Harrison. Going to a tropical island sounded like a plum assignment to Harrison. His buddy volunteered, so he did, too. They scraped tons of dirt from island surfaces and gathered up debris. They often worked in T-shirts and shorts. Radioactive materials were mixed with cement and buried in a blast crater on the island of Runit. 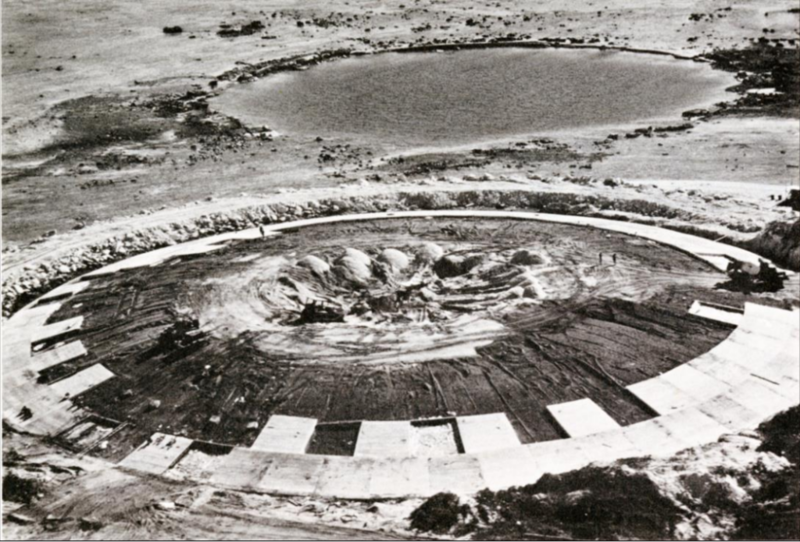 Later, the crater was sealed under an 18-inch-thick concrete dome. 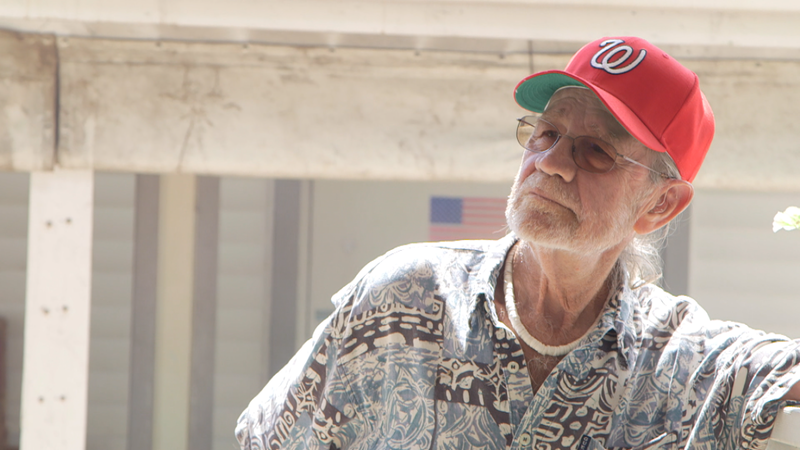 Just as the atomic veterans experienced illnesses years after their exposure, the cleanup veterans now are beginning to get sick. In a recent survey conducted by a group of the cleanup veterans, more than half the respondents reported a health problem they attribute to radiation exposure. These new atomic veterans have taken their plight to Congress. U.S. Rep. Mark Takai, D-Hawaii, introduced the Atomic Veterans Healthcare Parity Act in November, which would extend atomic veteran compensation to cleanup crews. In April, Sens. Al Franken, D-Minn., and Thom Tillis, R-N.C., introduced similar legislation. The veterans also share the belief that they have been neglected. Editor’s note: Jennifer LaFleur’s father, Lee LaFleur, was a Marine in the 1957 Shot Hood in Nevada. He died in December 2012. Amanda Pike and David Ritsher contributed to this story. It was edited by Robert J. Rosenthal and Amy Pyle and copy edited by Sheela Kamath and Nikki Frick. Jennifer LaFleur can be reached at jlafleur@revealnews.org. Follow her on Twitter: @j_la28.